This property is located at 626 Chiswick High Road in Greater London. Check room availability using the search box on your right. The Chiswick Moran Hotel is just 20 or so minutes from London City Centre and Heathrow Airport, yet nestled in the tree-lined tranquility of Chiswick High Road. This luxury hotel offers 120 fine-looking bedrooms, all of which have a surfeit of natural light and have air conditioning, broadband internet access, flat screen television, turbo hairdryer, work station and tea and coffee making facilities. 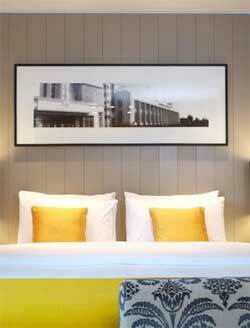 Each of the hotel's 123 bedrooms offer the best in contemporary design and fittings with a 'retro chic' feel. By car, leave the M25 at Jct 15 and take the M4 into Central London. Leave the M4 at Jct 1, and at the roundabout at the end of the sliproad take the 2nd exit A315 Chiswick High Rd., and the hotel is 150 yards ahead on your left. By train, take the District Underground line to Gunnersbury station. Leave the station and turn left onto Chiswick High Rd, and the hotel is 150 yards ahead on your right.